Welcome to the last Monday Meeting for the Rubbish Diet Challenge 2012. Last November I put a request on Twitter and Facebook to see if anyone fancied slimming their bins in 2012. Amazingly eight people volunteered straight-away and at the end of January, when routines had settled back to normal after the festivities of Christmas, the Rubbish Diet Challenge began, featuring weekly Monday weigh-ins and mini-challenges throughout the course of eight weeks. Eight households slimming their bins in just eight weeks, all living in different parts of the country, including one in the US, all with different routines, contrasting priorities, variations in local recycling collections and wide-ranging household sizes. But this was not an experiment or a test of perseverance, with me standing over them all with my beady eye. It was more a realistic timescale, that would give each household the freedom and flexibility to set their own waste reduction goals, and find out the information they needed to reduce their waste in the best way that suited their lifestyle. For all participants, it involved finding out exactly what they could recycle at the kerbside and further afield in their locality and use the facilities to which they had access. For some it involved buying less or switching to reusable products and for others it also involved having a bash at home composting. And everyone had a different starting point, including Ness, with her family of five, who had two full wheelie bins each fortnight (often accompanied by side bags), and Jax with her family of 6 (her baby was born in Wk 7), whose rubbish bin was always just a third to half-way full. However, as others agreed, it didn't matter how little rubbish they thought they were throwing away, times change and services often improve, so each wanted to find out more. And it's great to see that in every household, at least a 50% reduction has been achieved, with some households achieving this in the first four weeks and others achieving much much more since. While most participants were happily settled with their new slimmer bins, three households decided to take the finale Zero Waste challenge for Week 8 of the Rubbish Diet, with Suffolk's Kate & Terry-anna, and New York's Amy, pushing the limits to see how low they could go. And my word, did they do brilliantly! Terry-anna's bag of landfill rubbish, pictured above, was only half the height of a sauce bottle and Kate's household only produced just two mug-sized bags. Amy over the States is also pleased with her attempt at the challenge, producing so little rubbish that there's not even enough to fill half a small carrier bag, and weighing no more than 1.4 kilogrammes. But this challenge is not just about attempting a Zero Waste Week. It's actually the build up to that, which is more important. To quote Tim, who knew that he wouldn't be in a position to attempt a ZW week, "It's the habits I've acquired during the eight-week programme that'll make the difference". And you can see the impact of this in his last blogpost about his experience. Tim had started the challenge with a very full bin. For many who have participated, even though the guided challenge has finished, their own discoveries towards waste reduction hasn't stopped. Just as Donna, who slimmed her household's waste by 50%, said to me only last week, "It isn't over in 8 weeks - it's just begun!" I think Ness, who orginally started with two full wheelie bins, would agree with that. As I was leaving her house on Friday, after she'd been interviewed for BBC Radio Suffolk, she asked whether it needed to stop there and made it clear that she wants her Rubbish Diet to continue. Well there is plenty of scope for that as well as having more laughs in the process. I suppose introducing her to the Recycling Centre for the first time, bringing in a Master Composter to help her compost and poking around her mouldy fruit, have all been interesting ways to strengthen our friendship, And it is unfortunate that she had a poorly dog, who sabotaged any attempts she had to slim that bin right down last week. But moving forward, she is now volunteering to get rid of the second bin, which she no longer has a use for. When she first embarked on the challenge, she was adamant she would keep it as a comfort blanket. So I am quite sure this won't be the last you'll hear of Ness's Rubbish Diet. But for now, it's time for me to hang up my virtual bin-diving gloves for the Rubbish Diet Challenge 2012 and take the opportunity to thank everyone who has taken part, including all the households that have let me follow their waste-busting adventures, as well as those who have been inspired to join in along the way. Everyone has just been blimmin' brilliant and I'm also grateful to the Mark Murphy Show at BBC Radio Suffolk, which has followed the challenge from the very beginning. The list below shows the starting points as well as the final week results (please note that this was not a competition and participants were able to chose their own description of monitoring, which suited them best. Also some collections are fortnightly, so for those, the list also includes their latest fortnightly results as well as a separate final week's results). I'm still waiting for some of the final results to come in and these will be updated as soon as they are ready. In the meantime, do try and listen to the great interviews that were broadcast on BBC Radio Suffolk last week, with Kate & Ness. And again, huge congratulations and thanks to all involved, with results that range from 50% reduction to what I'd reckon is as much as 95%, I think now might be time to roll out the fanfare. 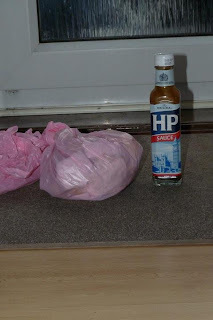 WK1 Weigh-in: 1.5 large bags, filling one third of a wheelie bin (fortnightly): Final fortnight: 1.5 very small bags that are dumpier than an HP sauce bottle. Final Week: a small bag that is only half the height of the sauce bottle. WK1 Weigh-in: 2 full wheelie bins (fortnightly). Final Fortnight: 1 full bin Final Week: Just 1 bag of normal household waste, plus a rug and plastic from the family dog's unexpected illness. WK1 Weigh-in: 1 30L rubbish sack. (weekly). Final Week: 1/2 30 rubbish sack, plus one-off polystyrene packing. WK1 Weigh-in: 1 unusually full wheelie bin - incl Christmas waste. (fortnightly) Final Fortnight: 1 small swing-bin bag: Final Week: 2 very small bags, approximately the height of a coffee mug. WK1 Weigh-in: 7 small bin bags - filling one third or half of a wheelie bin (fortnightly). Final Fortnight: Approx 5 small bags worth of rubbish, filling only half the bottom layer of the wheelie bin. Final Week: 2 small bin bags and some bits of polystyrene. WK 1 Weigh-in: 3 large bin bags, almost filling a whole wheelie bin. (weekly). Final Week: half a bag. WK 1 Weigh-in: 1 full wheelie bin (fortnightly) Final Fortnight: 3 small bags, filling just the first layer of the bin with room to spare. Final Week:. 5 small bags. Don't forget, just because the Rubbish Diet challenge 2012 is all over, it doesn't mean that you can't have a go in your own time. It can start whenever you like, just visit the online guide to catch up with everything you need to do and follow the weekly ideas. And if you want to join in the conversation on Twitter just use the hashtag #therubbishdiet, or tweet @karencannard. And do keep an eye on the blog over the next weeks, as I will be including an updated list of links and resources that will help you further in your waste-busting ventures.